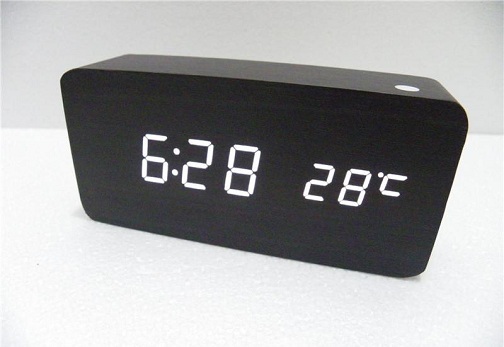 The desk clock designs are very useful and at the same time, they are also plenty of usages. For your convenience and choices, there are numerous varieties among the desk clocks which make you choose the best suitable one for you. There are white, black or any dark shaded faced dials of the clocks that make very easy to read. Most of them come with easy detection of numbers with back light options. In addition to the time display, the desk clock also provides us with the information such as date, day and temperature. Here we enlisted 20 cute and cool desk clock designs with images. Let’s have a look in to them. 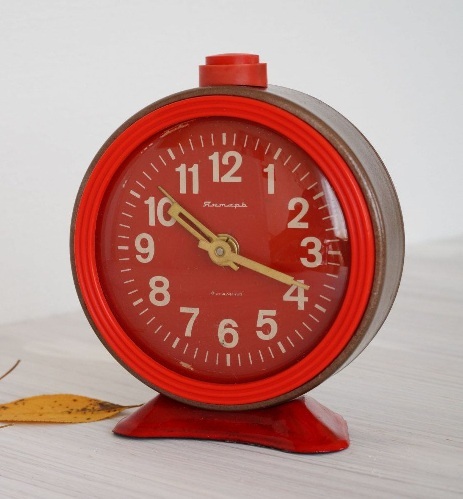 This small desk clock is featured with alarm facility and it gives the perfect vintage that can be decorated on any table of your home. It is in shiny red colour and has 120 grams of total weight. It is easy to carry anywhere and is made up of plastic material. 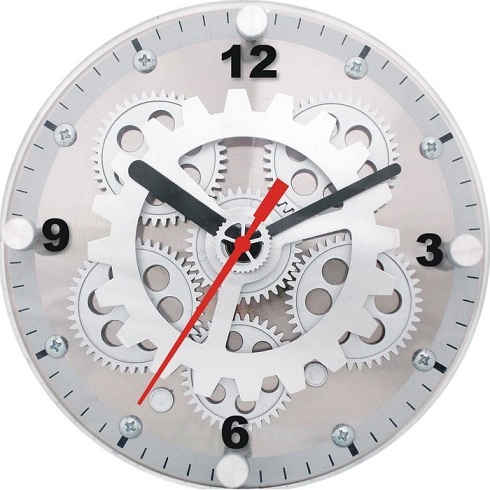 This is a stylish piece of 6” moving gear modern desk clock that has excellent functionality. This is a numbered desk clock which has bold black Arabic numerals that are easy to identify in one glance. They have moving gears and made up of metals. The second hand is made in the red shade. You can select this is an executive desk clock. The image shows an ideal office desk clock that is made out of black wood. This can display about 6 digit number and an alphabet with LED sem bedded in it. It is a cubical wooden shape with a digital mechanism. It uses a AAA battery and can also be made used for alarming options. These types are made with solid wood in American walnut style. 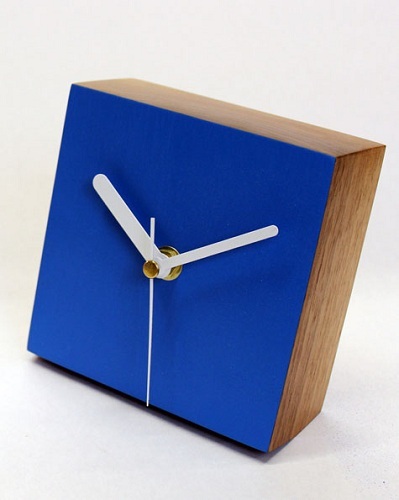 The face of the clock is available in variable contemporary colours. 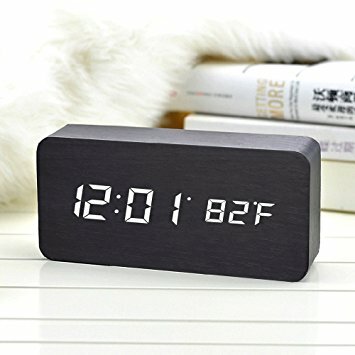 This unique desk clock has the dimensions of 12 x 12 x 5 cms. It displays time in simple analogue mechanism and has no alarm options. All the hands are designed in white shades. 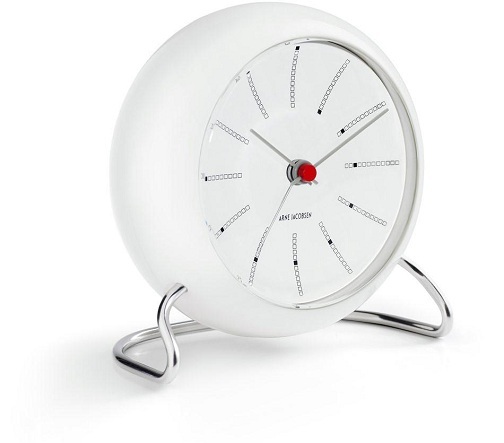 This is a fantastic collection of cool desk clock that is sleek and stylish in appearance. They possess a round shape and works with two AA size batteries. They work in analogue mechanism and has the features such as light sensors and snoozing options. It is made out of white ABS plastic materials. 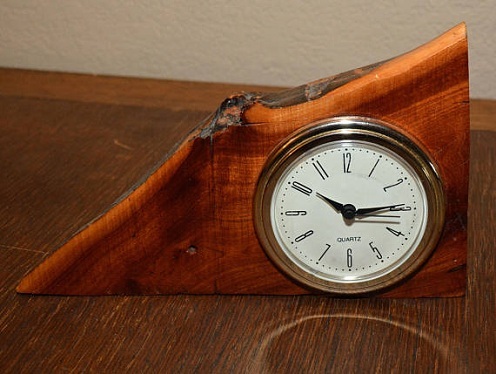 Explore the beauty of handmade wooden material unique desk clocks that work with a simple mechanism. It has been made with a unique piece of wood that has been smoothened and finished with multiple coats of varnishing finish to get that shine. It works with the quartz movement with battery options and can be easily set up. This is a transparent type crystal desk clocks that have gears and made out of direct engraving material. 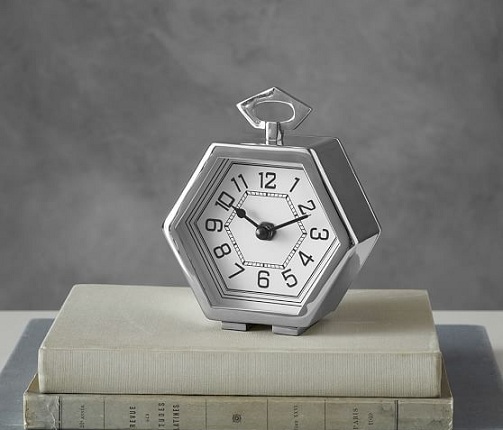 This cool desk clock is made using sandblasted engraving method with frosted imprint colour. This optical clock is 6.75 inches tall and uses the pattern of skeleton style. It better suits for a prestigious and cherished gift for anyone who you love. 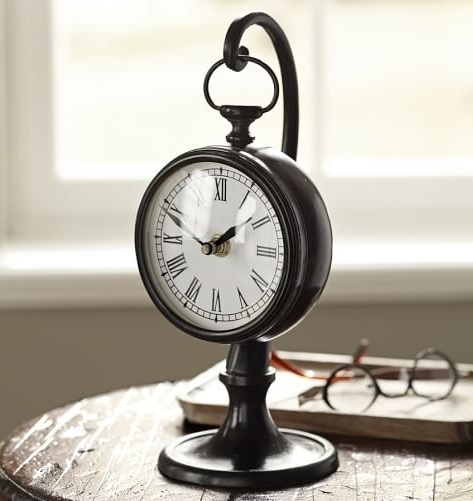 This timepiece would give a fresh and antique look to your office desk when it is kept over it. It has the dimension of 4.25” wide and 2” deep with 5.25 heights. This mini desk clock that has a glass front and uses AA size battery. 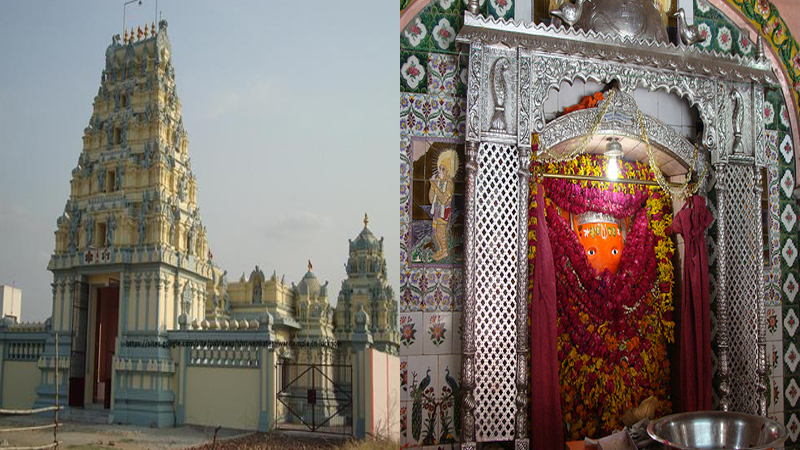 It is made out of stainless steel and aluminum materials. The exact measurement of this Seiko large desk clock is from the base and top plate with 2.2 x 3.2 inches. The overall height is 4.4 inches with handle up and 3.6 inches when it’s handle is down. 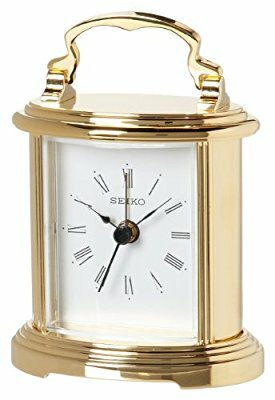 This fancy desk clock is plated with gold metal and has the Carriage facility. It uses one AA size battery. It also has a round button on its back when pushed and pulled; you are done with its possible usages. Take a look on this cool desk clock that is made of wood and is of the category of silent desk clocks. They have the alarm function that sounds gradually in increased tone and also has the snoozing time of about 5 minutes. They work silently without a ticking sound that ensures a trouble-free sleep during night times. It has night light with large numbers displayed. It’s no doubt that it would be the best desk clock design in the vintage series. It is something like a train station pendant clock that gives its elegance when kept at the bedside. The black frame of this clock is expertly crafted using metal with the best and unique craftsmanship. The face of the clock is ivory and has been endorsed with large Roman numerals. 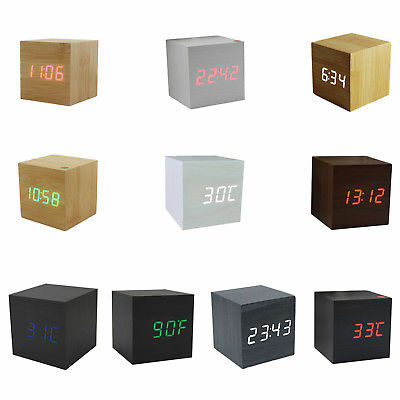 Here are the mini desk clock designs that are perfectly ideal for the usages in bedrooms and also on office desktops. They have the special feature of colour changing with 7 different shade options. 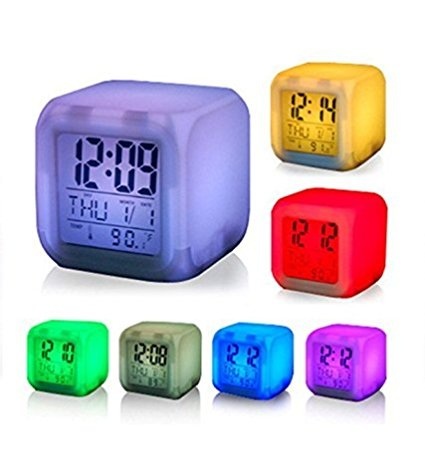 These led lighted desk clocks to display time, date, day and also temperature. These small digital desk clocks also have the feature of alarms. Have this stylish desk clock that is truly legible and easy to read with its feature of nautical clocks. 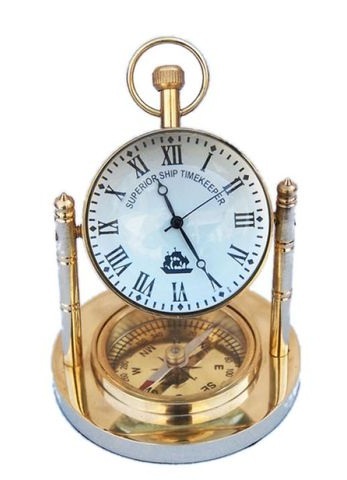 It is made out of solid brass metal and has 5 inches compass at its base beneath the round dialed clock. It would definitely be the ideal gift for the nautical enthusiasts and also for navigators. 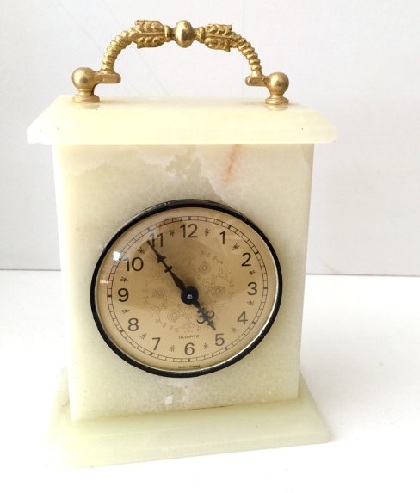 Discover this cute desk clock that is literally made out of Polaris pearl white shaded marble. This clock gives you the most stylish and sharp look wherever it’s kept either in your home or office. The marble from which it is made gas the measurements of 6 x 4.75 inches. This pretty desk clock has the unique design of gold-plated engraving option. It can be gifted for any occasion like retirement gift, weddings, and anniversary and also as the employee recognition when personalized. It has classical have desk engraved with golf foot base and a gold plate. The overall clock size would be 8 x 5 inches. 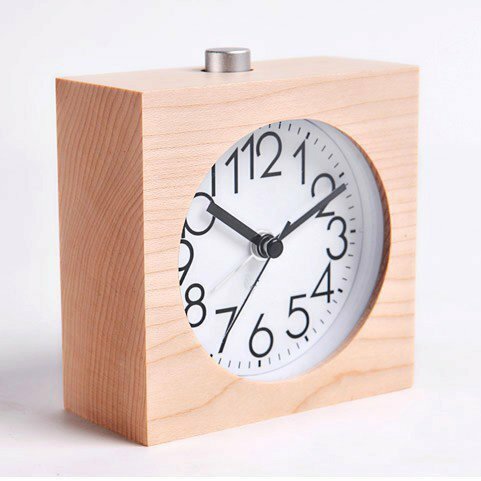 Now take a look over this small desk clock that is made using modern wood. 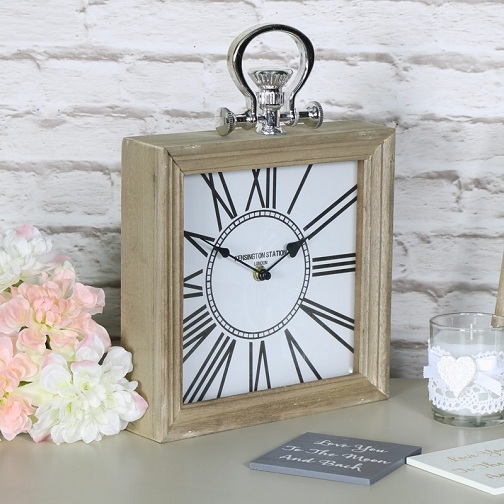 This clock is in a square shape which has a vintage style wooden case with fob style handle. It has a white clock face with Roman numerals. It also makes use of plastic and needs an AA size battery for its working. If you want to buy luxury desk clock then this will be a right choice. If you were in search of ideal office use desk clock, then you are right here for it. This is the digital desk clock with vibrant features of voice recognition LCD back light, alarm facility and also with weather indications. It sounds with two hammer alarm function. 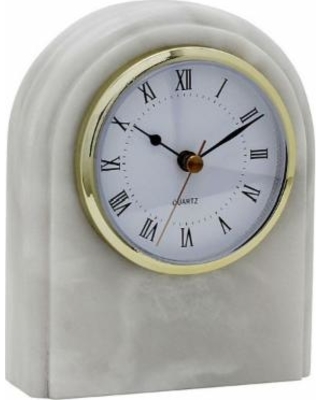 When you are concerned about the total weight of the clocks, then you may easily go for marble desk clock designs. 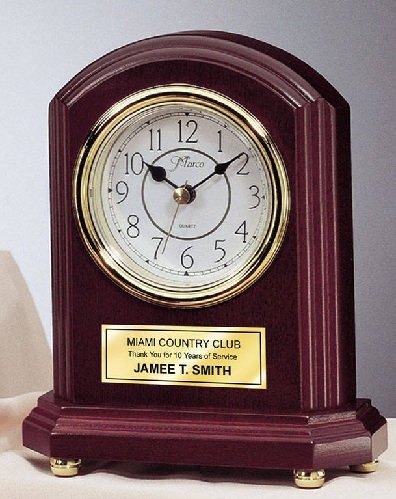 This is the large desk clock that is also heavy and wonderfully designed with a golden handle. It makes use of an AA size battery with the mechanism of Xavier quartz movement. The measurements of this clock are approximately 16cm x 10cm x 5cm. Here you get to have a wide array of choices in colours with the single piece of stylish desk clock. This is the wooden desk clock with cubical shape and has the entire possible feature that a digital desk clock would possess. It can display time, date and also temperature on each of its cubical sides. Moreover, it can be made to change its colour and can be made to display each function on each side. This is a modern décor that very well suits any office table. Make use of your alarm desk clock as a stationary stand when it’s kept on your table at home or office. 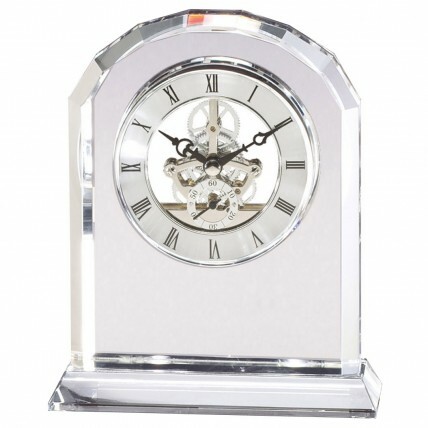 It is the stylish desk clock with silver shaded moulds. 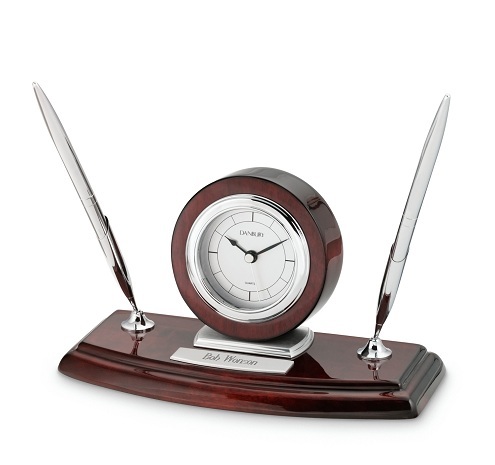 Both the timepiece and the pen stand are made out of stainless steel. With this retro desk clock, you can splash your table with elegant and sophisticated looks that have both fun and organized too. They make use of only one 1.5 volt battery and help you keep up your time wherever you go. All the desk clock designs have their own features and special characteristics. 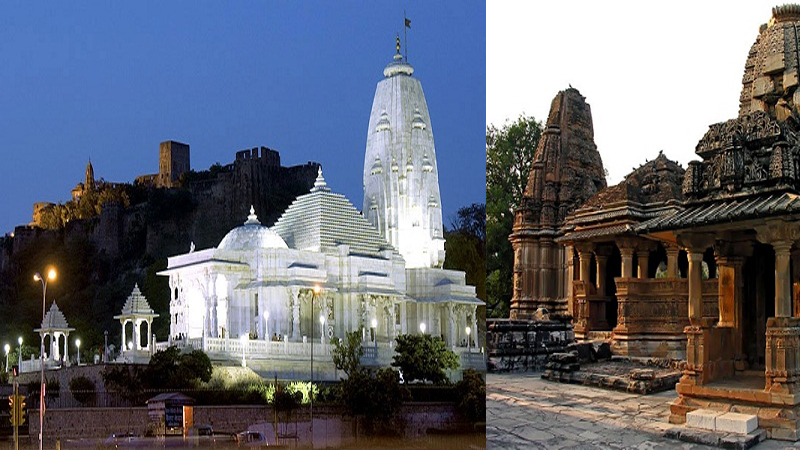 Each has a unique model designed and also with a fresh pattern that suits the contemporary modern world structure. There are various colour options among them to a make mismatch with the interiors. They have special features such as back light options during night time, switching off ticking sound during certain situations, small or large sized clocks, wooden finished ones, and mirror touched ones and also with nautical models. Besides these 20 top models, you still do have numerous options for looking into your best choices.